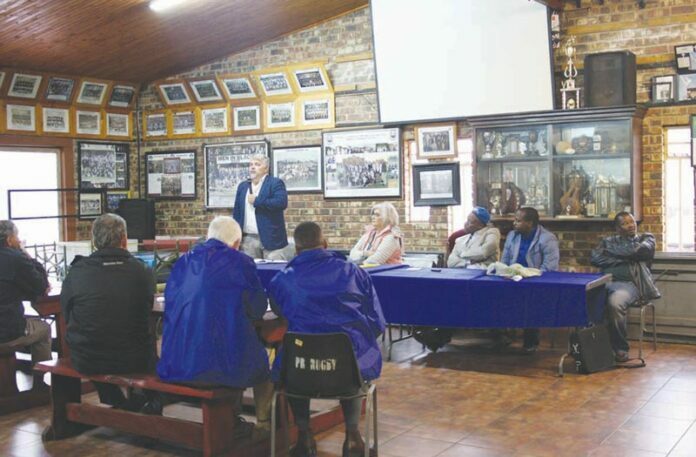 On a wet, cold and rainy Saturday morning, Mkhondo residents and members of the farming community surrounding Mkhondo, were invited to an informative public meeting regarding a subject that is on everyone’s lips, land expropriation without compensation. The DA’s (Democratic Alliance) Shadow Deputy Minister of Rural Development and Land Reform, Mr Ken Robertson, addressed the guests and made himself available to answer anyone’s questions pertaining to this sensitive subject that is currently creating panic across South Africa. The event was well-attended by various community members, business owners and farmers and Mr Robertson delivered a very informative speech which enlightened everyone in going forward. The information provided by him also led to various questions asked by the audience. Some guests wanted to know if a person’s property might be safer if you are in possession of a title deed, whilst others wanted to know what the South African Banks are saying, or doing, about expropriation of land without compensation. Surely the Banks will suffer severely if the government manages to proceed with the amendment of section 25 of South Africa’s Constitution which will explicitly expropriate land without compensation. Other concerns raised were what will happen to the reliable food sources in South Africa if farmers stop planting maize for instance as they are not sure whether they will have to hand over their property in the near future. People also mentioned that investors are no longer interested to invest money in South African farms and this creates constant panic among the farming communities. The overall outcome of the public meeting was somewhat divided. Some people feel that there are valid reasons for concern whilst others are just going on as normal. A visitor even addressed Mr Robertson and informed him that his farm, in close approximately to Mkhondo, has already been invaded. From the 72 hectares of trees he owns, he now only has about 12 hectares left, as the rest were cut down by the invaders who are planning to set up houses. Mr Robertson answered everyone’s questions to the best of his ability but it remains a touchy situation which basically affects everyone. He encouraged the guests to contact him if they have more questions or need advice on a particular situation pertaining to this subject. Mr Ken Robertson can be contacted on 076 687 2830 or via Cllr. Irene Brussow, on 084 475 2781. Timber theft – Justice is Served!